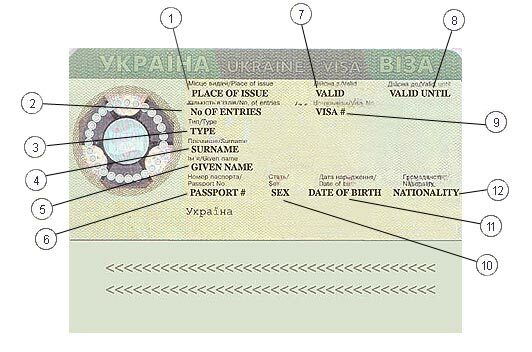 Notice: Upon receipt of your Ukraine Visa from the Ukraine Consulate you will need to use this Ukraine Visa How to read photo reference to assist you in verifying that your Ukraine Visa has the correct dates that will allow you to enter the Ukraine per your schedule. It is important that you check the Item # 7 Valid of entry. Our company is NOT RESPONSIBLE for mistakes made by the Ukraine Consulate. Be assured we will assist you in all and any manner possible to work with the Ukraine Consulate to correct any possible inaccuracy. 1. PLACE OF ISSUE (Location of Ukraine Consulate Chicago, Washington, D.C., New York or San Francisco). 7. VALID (You may enter the Ukraine on this date or any time after but prior to expiration.